Suara is a female Japanese singer born on August 3, 1979 who is from Osaka, Japan. She works under the label of FIX Records, distributed by King Records. Her two singles “Musōka” and “Hikari no Kisetsu” were both used as opening themes for the anime Utawarerumono and Asatte no Hōkō respectively. Additionally, her song “”Kimi ga Tame” was featured in episode twenty-six of Utawarerumono. Her song “Tomoshibi” was used as the ending theme of the anime To Heart 2 OVA. 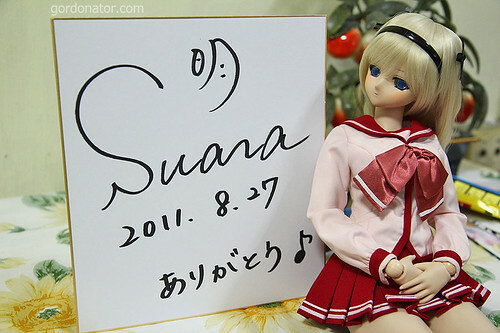 Her name “Suara” is derived from the Indonesian word for “voice”. She held her first solo concert in Singapore on 27 Aug 2011 as one of the events in A.C.M.E III. The concert was awesome, her live was good. I enjoyed it very much. Especially when she sang Tomoshibi from To Heart 2. It’s a nice song. This entry was posted in Autography, Music. Bookmark the permalink. Wow! I’m really shocked when I heard that Suara ever held concert in Singapore T__T. Can you tell me the songlist that she sung in the concert?